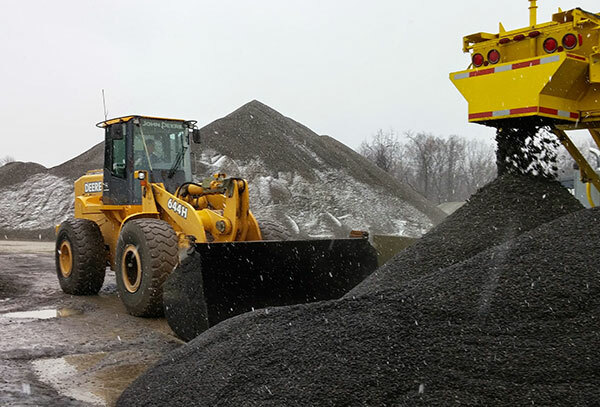 Stockpile Our Cold Mix Asphalt in Bulk for Ready Availability! We provide a 1- to 3-day delivery response time on our bulk delivery; bulk material is also available for pickup at our production locations. Our special formula will allow you to have your own stockpile ready for urgent needs. The material remains workable year-round and will allow you to make immediate and permanent repairs throughout the winter months that do not need to be replaced with hot mix once the weather warms up. Doubtful? Schedule a demo so that we can show you the workability and longevity of our cold mix asphalt. Our high-performance material can be applied in any weather (rain, snow, or shine) and will stay in the hole when competitors material washes or blows out. Save money and time by using the right product for a permanent repair! You can get your bulk load of HEI-WAY Asphalt by ordering directly from us or visiting one of our distributors.